Posted April 18th, 2012 by David Porter & filed under Social. Rumsfeld: "There are known knowns...."
If this ‘known knowns and unknown unknowns’ all sounds like gobbledegook, it shouldn’t. It was famously said by former US Defence Secretary Donald Rumsfeld in 2002, and what he actually said in defining the categories of uncertainty was: ‘there are known knowns; there are things we know we know. There are also known unknowns, that is to say we know there are some things we know we don’t know. But there are also unknown unknowns, the things we don’t know we don’t know’. How people laughed at the time. However, time has proved it to be quite profound. There are bound to be things that people don’t know that they don’t know. Most people are not experts at nuclear physics, so there are masses of things about that they don’t know and don’t know that they don’t know. When preparing a company marketing plan, you know about key people already, but you don’t know if there are other key people to reach. Putting together data on contacts you do not already hold is the hardest of all, yet has to be done. There is information you have not plundered simply because you did not know it exists. The unknown unknown has to become known known. Simple reliance on a data bank either acquired in-house by a business or bought from a data provider, is insufficient. The list starts to decay the moment it is acquired. People change their data details, either deliberately to protect privacy or for their own convenience. In fact, it now seems clear that the wider the parameters of any list, the more scope for changes. Dates of birth are constant; addresses, phone numbers, email addresses, employment status and purchase preferences change over time. Some sectors, like public service or legal/financial services are notoriously difficult to maintain accurate, up to the minute contact data about. London-based IT consultant Neil Alexander described on Maybe Technology, how when people are not very skilled in an area, they are more likely to think ‘pretty expert at it’, quoting psychologists Kruger and Dunning paper, Unskilled and Unaware of It: How Difficulties in Recognising One’s Own Incompetence Lead to Inflated Self-Assessments’. Alexander said that accurate self-assessment is referred to as second-order incompetence, the condition of being unskilled and unaware of it. He said the condition is a huge problem in software development, because ‘many programmers and managers aren’t aware that better methods and practices even exist’. He felt that only ‘once you truly become an expert, you become painfully aware of just how little you really know’. 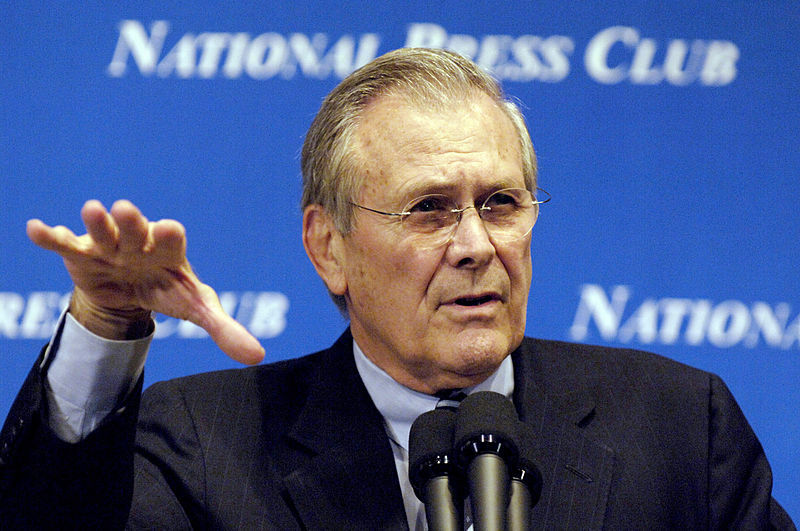 The Rumsfeld statement, originally about US defence, came to mind again when considering forthcoming changes to Google’s information retrieval system. Amit Singhal, the Google staffer who came up with the current Google search algorithm twelve years ago. In Google he is known as ‘Google Fellow’. He said last year that search ‘still feels very one dimensional’. He said people give Google a question, and Google returns results. “It needs to be far more communicative. You need to be able to have a conversation with your search engine. Most campaigners for internet privacy are secure so far. However, Singhal then crossed that line. ‘I want my search engine to be the expert who knows me the best. It needs to know you so well that sometimes you don’t need to ask it the next question’. Now the people who fear Big Brotherism are resisting the concept. Reassurances of privacy by search engines already sound hollow. Once they have started to think for you (based on what they know about you), there’s is no stopping them. Technology correspondent Emma Barnett, writing in the Sunday Telegraph on 18 March 2012, said that ‘these disruptive, innovative technology companies’ are offering people ‘ a solution to a problem they don’t yet know they have’. In other words, everything may appear fine with search, we’ve got used to it. But only the arrival of the sophisticated methodology will show people they didn’t know they were missing. It’s the unknown unknown again. She called it a ‘brave new frontier of search’, as she warned businesses to be sure ‘metadata, digital advertising and marketing strategies’ are ‘perfectly optimised’. The unknown unknowns phrase is becoming adopted into the technological prediction business. It is coming to mean a disaster or harmful event that was not predicted because it’s possibility was not known about before it occurred. Charlie Stross, techno blogger said in January 2012 of mobiles/cellphones, that a known unknown was how the industry would split over the next few years, whether Android or iOs for example becomes the dominant incumbent sector of the consumer electronics market. The unknown unknown, according to Stross was whether a ‘Carrington Event’ would wipe out ‘all our high-tech infrastructure and we starve’ or some other happening like some quantum breakthrough rendering everything known today unworkable. Richard Carrington was the observer/describer of the solar storm of 1859, which was the most powerful solar storm and solar flare recorded in history. So, a ‘Carrington Event’ could occur in the known universe, affecting air, ground, magnetics, winds, ice, seas, deserts and mountains of such magnitude that everything that has gone before is gone. Redundant. Irrelevant. Forgotten. Stross thought there was another category to be taken into account, the ‘implausible unknown’, such as ‘developments not actually compatible with the laws of nature or overturning major scientific paradigms. He put tachyons, telepathy and alien invaders in this category. However, just because something seems impossible based on what we known of the universe now, doesn’t mean it is impossible and will not happen. There should really be no unknown knowns in the future. Maybe Technology. Neil Alexander. April 2011.